The Double Size Eco-Keeper Bed Bug Tent has enough room for two people and is an immediate solution to keeping bed bugs away at night during your sleep. University tested, the Eco-Keeper Bed Bug Tent has been proven to lock out bed bugs so that you do not have to worry about being bitten by bed bugs while you sleep at night. 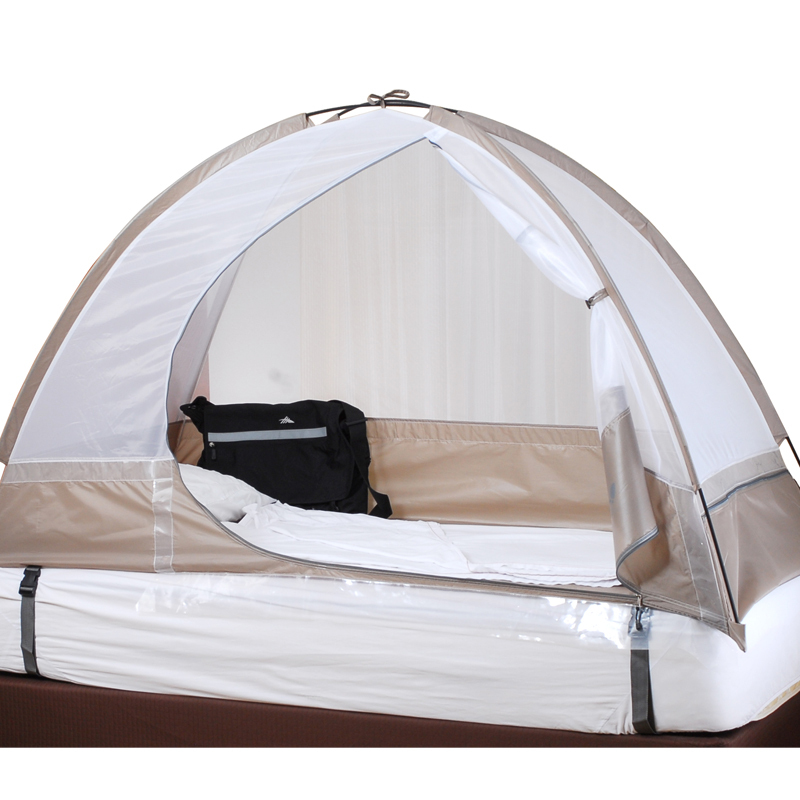 It is a lightweight tent that will rest on top of a standard queen size bed or larger. 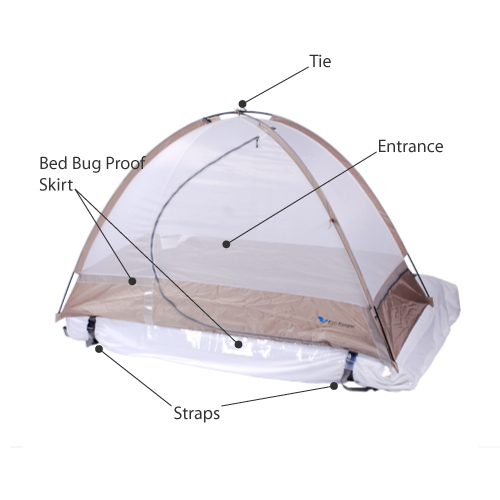 The Eco-Keeper Bed Bug Tent can easily be assembled, disassembled and carried around in a convenient travel bag to use in the house, while traveling, when going back to the dorm, and much more. There are a variety of features that are found on the Eco-Keeper Bed Bug Tent that have been designed not only to keep bed bugs out, but to provide the most comfort for the people inside. The Eco-Keeper Bed Bug Tent is university test and is proven to keep bed bugs out while the people inside can rest without worrying about being bit during the night. It is one of the newest products on the market for bed bug control and will provide immediate protection for people even in the midst of the most severe bed bug infestations. - Protection at Any Angle: The tent keeps bed bugs out from all sides, whether they are trying to crawl up from the base of the bed or fall from above the sleeping area. - Bed Bug Climb-Proof Skirt: Different from standard bug tents, the Eco-Keeper Bed Bug Tent was designed with a unique skirt that is made of a plastic that bed bugs are unable to climb. This means that bed bugs cannot climb from the base of the tent and will not make it past the climb-proof skirt. - Straps with Built-In Traction: The strips of traction pads on the straps that are used to hold the tent in place add even more security so that the tent does not slide around on top of the bed. - Zipper Pocket: The zipper pocket covers and secures the zipper when it is closed so that it can help to minimize potential entry points into the tent. 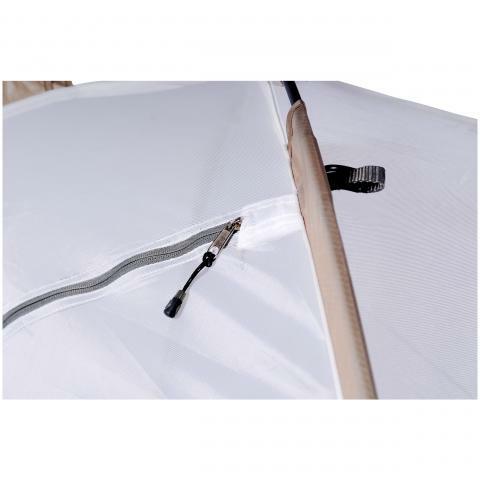 - Double Sided Zipper: The Eco-Keeper Bed Bug Tent can easily be opened and closed from either the outside or inside of the tent making entry and exit from the tent easy. 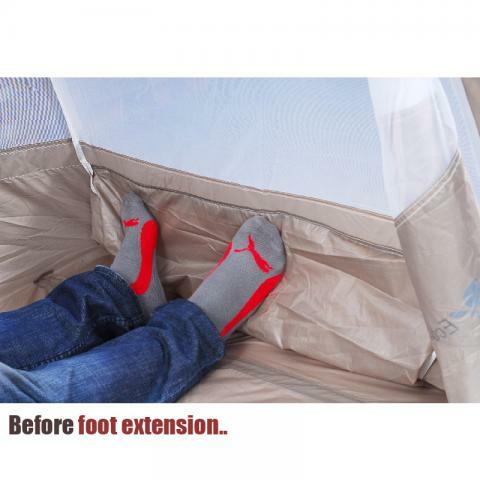 - Foot Extension: The Eco-Keeper Bed Bug Tent in both the single and double sizes features a built in foot extension to provide added comfort. It is an optional feature and can easily be pulled out from the end of the tent. - Ergonomic Design: The material of the mesh allows the tent to be highly breathable. It does not block air flow and will allow the air to move freely, which means that it will not block the cool air from fans during the summer season and the heat from heating devices during the cold season. 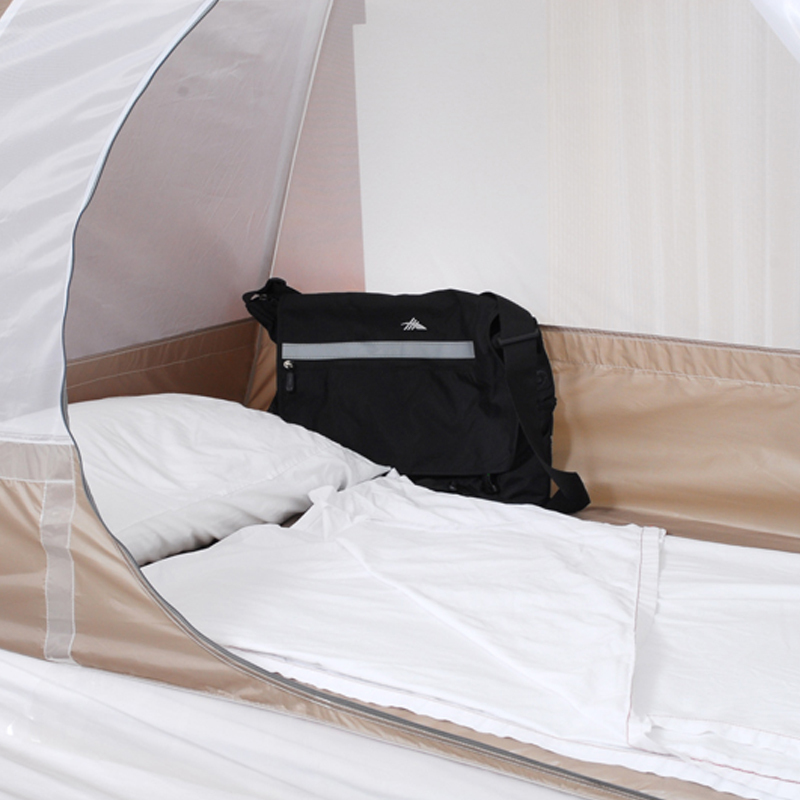 - Travel Bag: The Eco-Keeper Bed Bug Tent is packaged in a zip-up travel bag that, which makes it easy to carry the tent around when traveling. The Eco-Keeper Bed Bug Tent has not only been university tested to keep bed bugs out, but it has proven to keep out other insect pests like flies, fleas, mosquitoes, and many more. DISCLAIMER: Although the Eco-keeper Bed Bug Tent has been university tested and proven to be a bed bug proof apparatus to keep bed bugs out, it will not actually kill bed bugs and will not work as a killing agent against bed bugs or other insect pests. 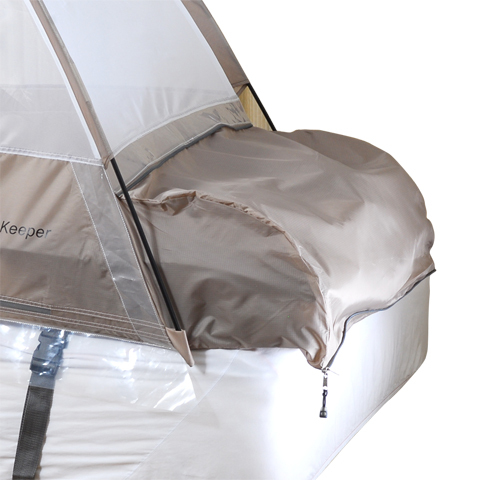 Eco-Keeper is not liable for bed bugs that have been carried inside the tent by the end user. The user is responsible for thoroughly inspecting oneself, their surroundings, and any other object before entering or bringing the object inside the tent. Call 1-800-788-4142 for more information on bed bug control.